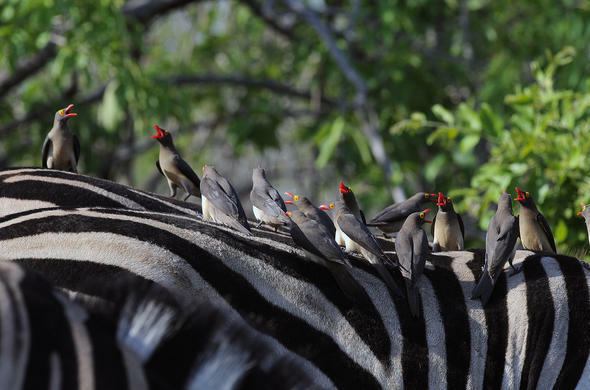 Kruger's rich birdlife is a consequence of the diversity of habitats that fall within the broad definition of woodland savanna. This environment contains a variety of more specialised habitats, each determined by a range of factors including geology, climate, rainfall, river systems and latitudes. Habitats are not static - they undergo their own cycles of change, affected particularly by the long-term patterns of dry and wet weather, as well as by human intervention. Kruger is generally hot, even in winter. But it can get surprisingly chilly during summer evenings, and very cold during winter nights. Summer days are very hot and often humid with daily temperatures averaging around 30 degrees. The heat can be unpleasant at times, particularly in the north, where temperatures can occasionally rise to a blistering 45 degrees. Evenings are generally warm with the mercury rarely dipping below 18 degrees, although there can be the odd cool night. Irregular showers and thunderstorms bring some relief from the heat. In summer, the best birding times are between 4.30am and 9.00am and then again in the late afternoon from 4pm. Winters are dry and warm to hot with an average daytime temperature of 23 degrees, although it can get as hot as 35 degrees at times. Winter evenings are cold, by contrast, with average minimum temperatures around eight degrees, and occasionally dipping below freezing. Frost occurs rarely and is restricted to low-lying areas. Visitors should bring warm clothes in winter. Sunrise in winter is a good two hours later than summer, so early morning birding is best between 6.30am and 10am and then again from 3pm until dusk. Evening and early morning drives can be chilly to cold in both summer and winter. Make sure you have a warm jacket for any excursions in an open game vehicle.